People almost never speak in perfect sentences. In journalism school, I spent hours writing down verbatim what people said. Real people mix up tenses and subject/verb agreement, repeat, trail off, and go off on tangents halfway through a sentence. Too much of this on the page would be annoying, but a little goes a long way toward establishing authenticity. Conversations are rarely entirely logical. One person asks a question and the other gives an answer that doesn’t quite match. One makes a comment and the other changes the subject. This happens when we’re obfuscating and when we’re genuinely trying to communicate. We invariably have our own agenda, our own distractions, our own inner drama playing loudly in our head. Words carry only a portion of the meaning of dialogue. When you study a play, you realize how much is conveyed by tone of voice, by timing, by physicality. On the page, you can utilize the cadence of the dialogue to convey mood (i.e. Is it percussive? Fluid and languid? ), and you can make use of a character’s body language (Is she looking at the door while she’s talking? Picking at food?). What’s not said can be important. And colloquial dialogue juxtaposed with a lusher, more expressive narrative voice can convey the sense of a rich inner life behind the words. “Said” is your friend. “She declared, she exclaimed, she cajoled, she fulminated, she shrieked….” These just call attention to themselves and feel manipulative; they’re cheap ways to conjure emotion. As a fiction editor, I saw how “said” disappears on the page and allows the dialogue and action to stand out. Using dialogue as a delivery system for lots of exposition is also a cheap shot. People don’t give each other a ton of back story in real conversations (“Remember when we got married ten years ago…”). Let dialogue advance the story. Having one character tell another character a story can establish character. In my novel Carrying the Body, one of my characters keeps trying to tell the story of the Three Little Pigs; the way she corrupts the fairy tale is a way of showing the reader who she is. My best piece of advice is this: Always read your dialogue aloud. If it makes you cringe (which happens to me often on the first round), if it comes out sounding like words no one ever spoke, you know you have your work cut out for you. 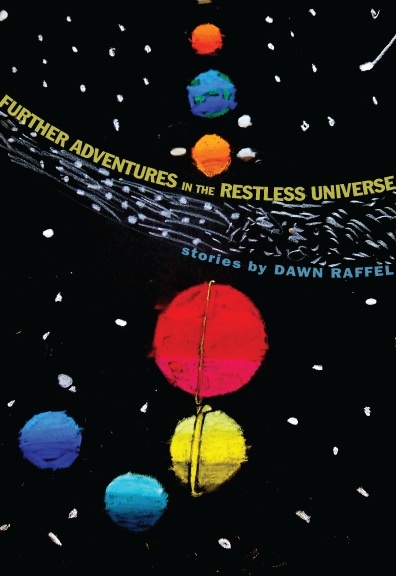 Dawn Raffel’s newest book, Further Adventures in the Restless Universe, is a collection of 21 very short stories (several made up almost entirely of dialogue). She is also the author of a novel, Carrying the Body and a previous collection, In the Year of Long Division. Her fiction has appeared in O, The Oprah Magazine, The Anchor Book of New American Short Stories and numerous journals and anthologies. She has taught creative writing in the MFA program at Columbia University and at the Summer Literary Seminars in St. Petersburg, Russia, and is a longtime magazine editor. Her website is DawnRaffel. Her YouTube video is Further Adventures in the Restless Universe.